Welcome Doug Powell to Luray! If you’ve raced at Luray Triathlon in the past 3 or 4 years, you may have noticed an athlete wearing a Team Z jersey on the course riding a tandem bicycle or running with a guide. Meet triathlete Doug Powell. Doug has a degenerative eye disease that has resulted in the loss of most of his vision. 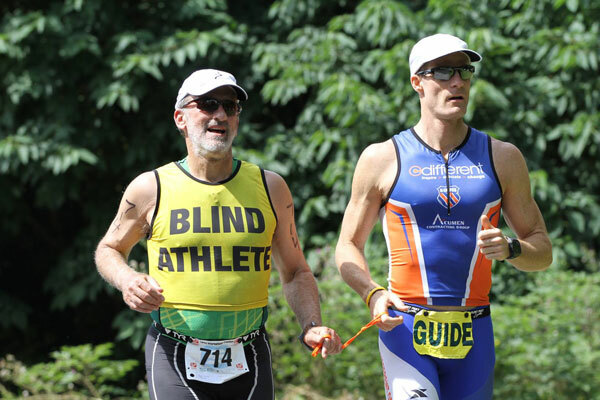 I can’t imagine attempting a triathlon with its swim, bike and run without being able to see. Wow! Doug will be at Luray again this year at Luray to complete the “Devil’s Double” by completing both the International and Sprint triathlons. We interviewed Doug to find out more about him as a person and a triathlete as well as find out his tips for Luray Triathlon. Here’s what Doug had to say. Hi, I’m Doug Powell, living in Falls Church, VA. I’m 64 years old, have been married almost 41 years, and have two grown children. As a young kid, I loved baseball, but never made the transition from softball to hard ball — probably because my eye disease was starting to show up, although we didn’t know about it at the time. I have an eye disease called Retinitis Pigmentosa, a degenerative disease that attacks the rods on my retina. Over time, I’ve lost virtually all of my peripheral vision, all of my color vision, and parts of my macular vision. I’ve always loved sports. This body I have was meant to enjoy moving and challenging itself. Just because I have lost most of my vision doesn’t mean I’ve lost my desire to play. I’m also a grazer. I don’t think I could stay interested in only one sport. Triathlon, with its 3 disciplines, has become the perfect solution. Before I saw the Hawaii Ironman on TV in ’84, I was an occasional recreational weekend warrior. Swimming and biking were the main activities — nothing regular or disciplined. Since deciding that I had to do an Ironman, I’ve more or less been in training with very little breaks. This year will be my 3rd or 4th Luray, either as an individual, or relay. Q: What one piece of advice would you give any triathlete racing in their first Luray Triathlon race? I always caution new triathletes to be patient. It’s very easy to spend a lot of energy in the open water swim, or on the “false flat” on the bike course, and have nothing left for the rolling run. A few minutes slower on the swim and bike may mean a much larger difference if you can run rather than walk the entire run course. Doug, thank you for inspiring. Good luck this weekend!